Purchasing tickets for entry at the venue is not only time consuming but often times, futile. Usually, same day entry tickets on site tend to sell out before mid-day, even if you waited in line for several hours, as many visitors must do. Our fast track Louvre tickets provide you with priority access to this iconic museum. You will be able to bypass the arduous ticketing queues in your line and after a brief security check that is mandatory for every visitor, you are free to roam the halls of the Louvre. Feel free to browse through some of the 380,000 exhibits (with 35,000 currently on display) in the Louvre Museum. These are spread over 8 curatorial departments – Egyptian Antiquities; Greek, Etruscan, and Roman Antiquities; Near Eastern Antiquities; Islamic Art; Decorative Arts; Sculpture; Paintings; Drawings and Prints. From Egyptian artifacts that are 4,000 years old to modern works of art from Oriental artists, the Louvre has been the honorary arbiter of our artistic heritage. As you gaze at these works of art, you aren’t just looking at paintings but emblems of our history. Going through the galleries of The Louvre is an experience that everyone must experience once in their lifetime. Most people only visit the Louvre once in a lifetime. Our priority access to the Louvre guarantees that you have a once-in-a-lifetime, hassle-free experience when you’re there. 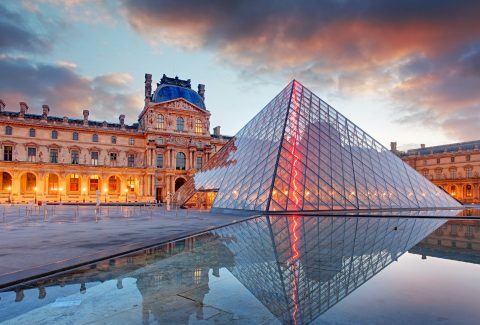 Your tickets to the Louvre Museum combine the benefits of a fluid redemption process with priority access that helps you save your precious time by booking exclusively with Headout. Please note that, as per museum rules, it is mandatory to provide us with the correct names of each individual in your party at the time of booking or you will be denied entry at the venue. Groups of 7 or more will need to visit the Louvre separately or purchase a group tour. Groups of 6 and lesser can book online. In the next step of the booking, you will have to choose the date on which you would like to visit, along with the time slot during which you will gain entry. You will be allowed to gain entry within 30 minutes of the selected time slot (for example, should you choose a 10 AM time slot, you will be allowed to gain entry up until 10:30 AM) by lining up in the yellow line meant for visitors with pre-purchased tickets for a certain time slot. The Louvre Museum is open every day, except on Tuesday and holidays such as Christmas Day, New Year’s Day, International Workers Day (May 1) and End of the Second World War day (May 8). On Monday, Thursday, Saturday and Sunday; the museum is open from 9:00 a.m. to 6:00 p.m. On Wednesday and Friday, the museum is open from 9:00 a.m. to 9:45 p.m. Entrance is free every first Saturday of the month (between October and March) and on the 14th of July. On regular days, entry to the museum is free from 6:00 PM - 9:45 PM. Entry is free for children under the age of 18 and European Union citizens under the age of 25. Please display a valid ID at the entrance of the museum for proof of age. The closest metro station to the museum and the one where our ticket redemption center is located is the Palais-Royal–Musée du Louvre station on Line 1. If you’re traveling to the museum by bus, buses 21, 24, 27, 39, 48, 68, 69, 72, 81, 95 stop at the Pyramid. Wear comfortable shoes and carry water as there is going to be a lot of walking. You can also borrow walking sticks and foldable fabric chairs from the museum center free of cost. Wednesday and Friday are the best days to visit the museum as it stays open till longer and you can linger about the museum in peace as the crowds lessen considerably during the closing hours (9:45 p.m). Try going either early in the morning or around 3 p.m. in the afternoon. You’ll never have the Louvre Museum all to yourself, but mornings and evenings will be the least crowded hours of the day. To dodge long queues, we recommend using the 'Lion's gate' if you want to avoid the crowds entering through the pyramid. It is located on the east of the Pont Royal on the Quai des Tuileries. You will receive an email with your Louvre Museum tickets instantly. No need to print. Display your mobile tickets main entrance. Please note that these are not flexible entry tickets and should you miss the date or time of entry, you will not be able to reschedule your tickets, but you will be subject to the same entry conditions as those without tickets, i.e.center you will have to line up to gain entry in the green line for visitors without pre-purchased tickets. The main entrance, the Pyramid entrance, head to the pyramid and look for the yellow line with the sign “avec billet” that means “with tickets” to the left of the normal line. After a brief security check, you will be able to enter the Louvre Museum. Please note that you will only be able to gain entry through the Pyramid entrance and not the other two entrances. After a brief security check, you will be able to enter the Louvre Museum. Should you miss your time slot, you will have to line up in the green line to gain entry along with visitors without pre-purchased tickets.